Not only was Lyric Theatre @ Ilinois’s first year a triumph on the stage of the Tryon Festival Theater, our students challenged their limits in the classroom and in a variety of smaller local venues. Written and conceived by Bill van Horn and Gene Scheer, with additional musical material from Chicago’s own Gary Fry, Polly Peachum delighted more than 200 people on April 11 in the Colwell Playhouse. The workshop helped the authors gain a more complete perspective on the play with music, which detailed the behind-the-scenes circumstances and cultural context surrounding the creation of John Gay’s revolutionary The Beggar’s Opera. The music, theatre, LAS, and high school students, joined by community members and even a surprise faculty member, prepared for 6 weeks under the guidance of Assistant Director Dawn Harris, Musical Director Michael Bagby (a first year DMA student of Dr. Julie Gunn), and faculty advisor Michael Tilley. Then the authors arrived for two weeks of intensive and rewarding work, staging the entire production and even rewriting the ending - that’s what workshops are for, right?! The final presentation was accompanied by guffaws and peals of laughter from an enthusiastic audience and provided a compelling demonstration of the integrative emphasis of the Lyric Theatre Department. 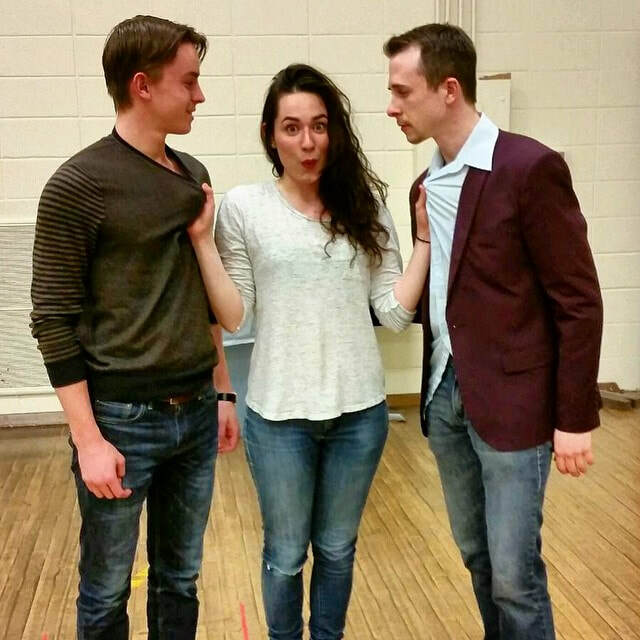 Chris Anderson, Madeline Whitesell, and Lyle Jackson in a rehearsal for Polly Peachum. Mr. Gay, may I introduce Miss Polly Peachum. Thank you, Miss…for showing me the way. She is both my passion and my protégé, Mr. Gay. She has taught me the rewards of love and I have taught her the wages of sin. She can coax a sovereign from the stingiest miser. She can feign palsy, rickets, cholera and several other diseases, as yet unnamed. The world of the beggar, Mr. Gay, like the world of the actor, survives on artifice and trickery.